Two special things are going on here today….one is an instagram hop (see below) – and the other: this is “nativity week”! I noticed I had 2 nativity type of scenes scheduled, and decided to add 2 more and fill up the week (except for Thanksgiving!) with more. So…..today the Shepherds watching their flocks by night are getting a little attention! 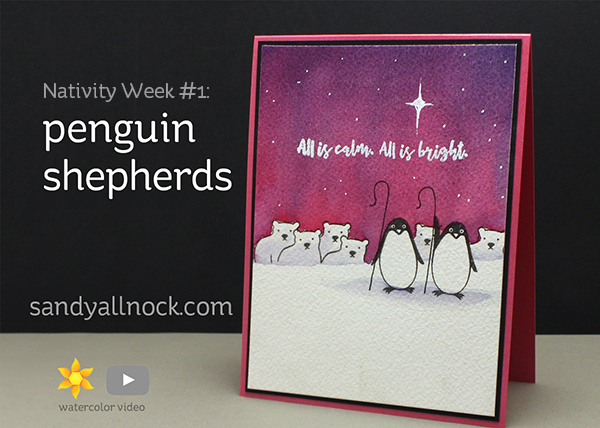 This is the silliest of the series – penguins shepherding polar bears! A friend of mine was actually kinda scared for the penguins, since she saw the polar bears not as the “flock” but as menacing. Eeep! Well…..there ya go, right? Watch the video below or click HERE to see it in HD on YouTube. Aren’t they the cutest little shepherds ever!??!! I don’t think their flock is menacing at all! heehee! 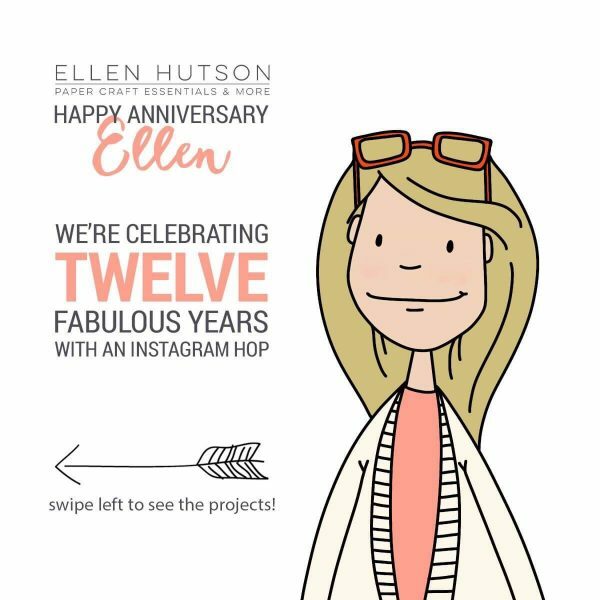 It’s Ellen Hutson’s 12th anniversary in business – and a bunch of us are surprising her with an instagram hop! So be sure to look for this image to jump in and hop along,,,,my post is HERE! 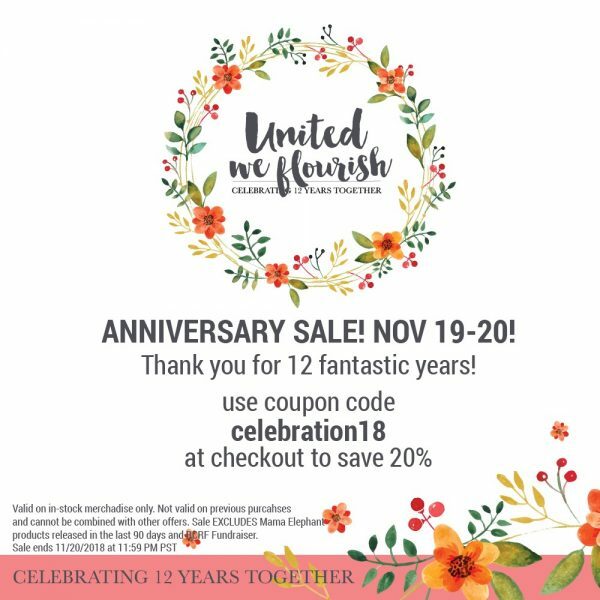 Love the colors of this card – and I’m mesmerized by the way you moved them around! And polar bear sheep! 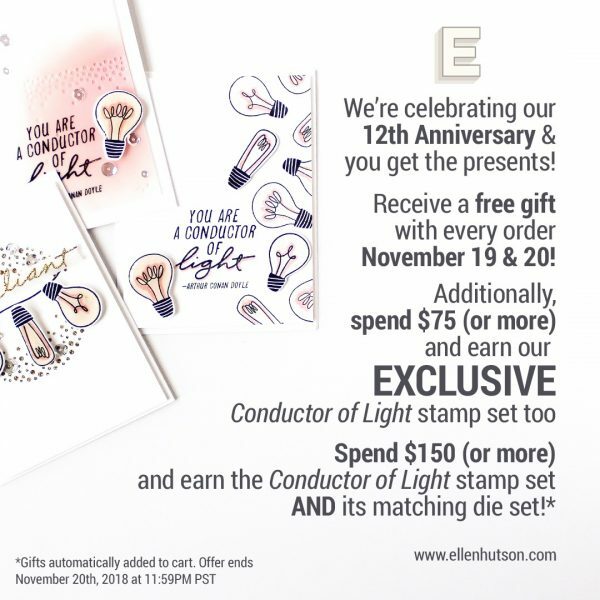 Too much fun – thanks for another great idea-starter! I love a theme week again. Fortunately you not only make serious cards, but also cards with a great sense of humor or a big smile. Thank you so much for this gorgeous card, love what you did. 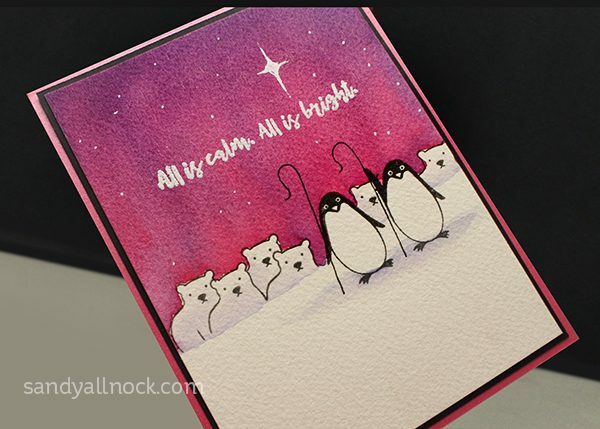 Such a cute card with its row of curious polar bears peaking from behind their guardian penguins. I love how the penguins think they are in charge!!! What an adorable idea. And I love the pink sky. Happy Thanksgiving and thanks, as always, for sharing your talents with us. Oh my goodness this is fun AND CUTE! Really enjoyed this fun card, why don’t penquins shepherd the polar bears, these bears need to be looked after too. Loved it. When you were rolling the paint around I feared you would cover your creatures but it would not of happened as I found I was tilting my tablet to stop it, how silly am I hehehe. Have a fabulous thanksgiving all. I grinned the minute I saw this humerous card, and continued to grin for a some time later. I think you may be the only one that would come up with this cute idea. We sure could use some smiles.